Gucci jacket has designer-stamped gunmetal hardware, a press-stud fastening collar and fold-back lapels, press-stud fastening cuffs, a buckle-fastening belt at waist, press-stud and zip-fastening pockets, an oversized storm flap at back, an asymmetric zip fastening at front and is fully lined. 100% python; lining: 100% cotton. Specialist clean. Designer color: Sahara. 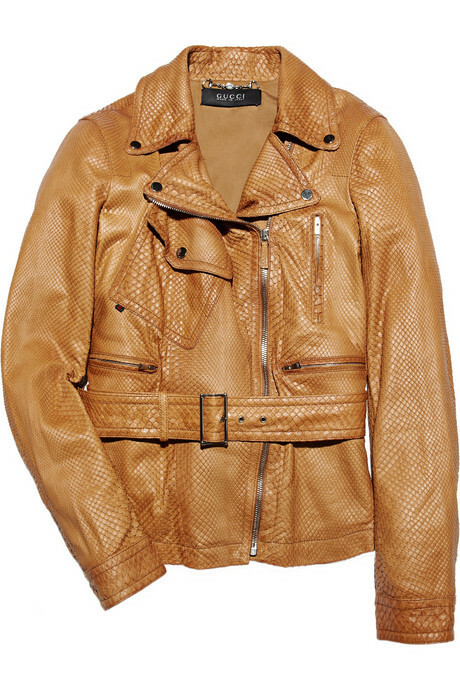 Gucci's caramel python motocross jacket is a new-season take on a classic style. Wear it for weekends in the city with a fine knit and layered gold necklaces.